Photos by Oregonian photographer, Ross Hamilton. Just in time for Valentine's Day: more truffles! 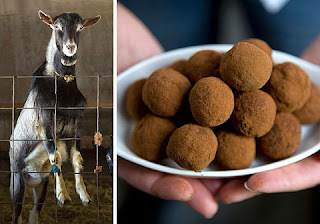 I really do make more things beyond these delicious, chocolate goat cheese truffles. Perhaps some nice fresh chevre to go with your dessert wine? But I'm not going to deny the world of these silky morsels of chevre and chocolate. Tami Parr writes the cheese column for Portland's Mix Magazine, a bi-monthly magazine published by our local paper, The Oregonian. February features Briar Rose Creamery and our truffles. Yay! Tami came out to the creamery the same day we had a tornado touch down five miles away in Aumsville, Oregon. Also feature on that day: an inspection by the Oregon Dept. of Agriculture - we're doing fine! How's that for timing? Is there a message from the Universe in there somewhere? Forever plagued by weighty issues, I look at these photos and see the need to go on a diet. But, my-oh-my! Don't those truffles look good! Nice shots of Shawn's bucks, and a group shot of the does in the dairy barn. Here's the link to the article in the February 2011 issue of Mix Magazine.